Keto Eggs Benedict is simple to make at home with a few tips and tricks. 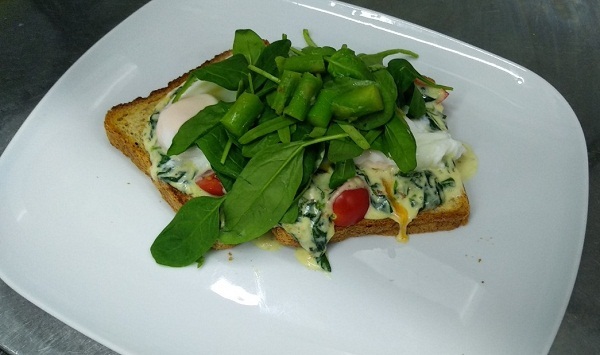 This version has a perfectly poached egg blanketed with a cheese spinach sauce all on top of a keto toast bread. Easy enough to make every single day. Chop baby spinach into bite size pieces. Add the spinach, butter, garlic, a medium saute pan and cook for 5 minutes or until spinach is completely wilted. Allow spinach mixture to cool. Meanwhile, mix the cream cheese (room temperature) and cheese together until it’s nice and smooth. Add the spinach mixture to your cheese mixture and mix well. Spread spinach mixture over the toast.